AAEA President Norris McDonald, second from left, members John McCormick, far left, and John Rosenthal, far right, met with Council on Environmental Quality (CEQ) Chairman James Connaughton, second from right, to discuss energy and environmental issues. They all agreed that something must be done about the structural conflicts that are pitting and will pit energy delivery and efficiency goals against air quality and global warming goals. These structural disincentives must be reconciled in order for America to meet our energy efficiency, delivery and atmospheric goals. The meeting was productive and also included discussions about environmental justice issues. CEQ was created by NEPA (1969) and has eight duties and purposes:Assist and Advise the President in preparing an annual environmental quality report, gather, analyze, and interpret information on trends in the quality of the environment, review and appraise federal agency compliance with the environmental policies of NEPA, develop and recommend to the President national policies to foster and promote the improvement of environmental quality, conduct investigations, studies, surveys, research, and analysis relating to ecological systems, document and define changes and trends in the natural environment and their underlying causes, report at least once each year to the President on the condition of the environment, and make recommendations to the President with respect to environmental policies and legislation. By Norris McDonald. Seong Hoon No, right, was a great young man and he was murdered at the age of 32 in his family-owned store. He was always behind the counter with his quiet, taller 33 year old brother, Yoel. Although Hoon died from his wounds, Yoel was also shot but is recovering. He always had good conversation to share. We bantered as I bought my beer. When he wasn't waiting on customers he always had his head in a book or his laptop. We debated politics and he just couldn't believe some of my political positions. He worked with his father, mother and two brothers. They ran a convenience store with a deli in the back and the liquor store. It was quite interesting to hear them bicker in Korean with each other sometimes. They also did not take any mess. Yet, you couldn't meet nicer people anywhere. Now Hoon is dead. Shot to death by two robbers (animals) two blocks from my home. 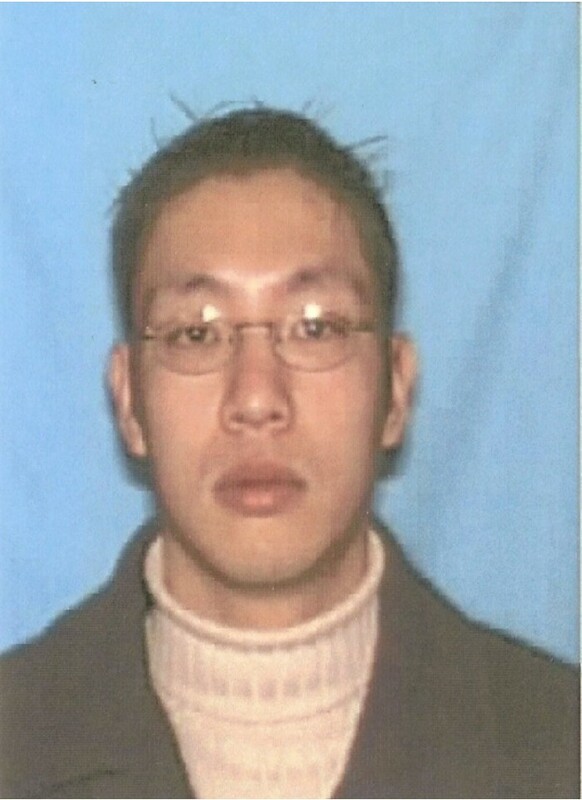 Hoon was murdered on Saturday, January 27, 2007 at 3:30 p.m. at Fort Washington Liquors, located at 10200 Old Fort Raod, Fort Washington, Maryland. The Prince George's County Police Department is offering a cash reward up to $25,000 for the tip that leads to the arrest and indictment of the suspects. I hate the reality of Black-on-Black murder. I hate that my friend Hoon was killed. So smart. Hard worker. Loyal to his family. The spiritual disease of murder has infested our community. This toxic pollution is ruining our environment. Our community has to find a way to end this war. This insane war of the murderous tenth polluting our neighborhoods. More from one of Hoon's friends. I attended the funeral at the Korean Presbyterian Church in Vienna, Virgina. It was the saddest event I have ever attended in my life. Although I hate generalizing, I have to admit that I would not blame the family for hating all black people. Yet they greeted me warmly as they did the many other black people there too. We cried together over this great loss. I did not know they are Christians. That explains a lot. Many people from Prince George's County attended the funeral. A Maryland State Senate Resolution honoring Hoon was read. Hoon's name is also being spelled as Seung Hoon Ro. Although it might be well known in England that Prince Chalres is a rabid environmentalist, we did not know he was so passionate about the issue. We don't remember him weighing in on the Kyoto Protocol (U.K. is a signatory). Now he is in the USA to receive an award from former vice president Al Gore, another guy who did nothing on the environment when he was in office. He is doing a lot now. He must be running for president. Has to be. Traditional environmentalists in the USA and UK are being critical of this award and the carbon dioxide producing trip to receive the award. We hope he at least purchased carbon offsets for the trip. 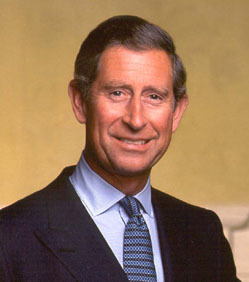 Prince Charles and his wife Camilla also went to the Hood, if Harlem can be considered the Hood. Brownstones there a selling for $1 million and 125th Street is a commercial Mecca. Anyway he was photographed and videotaped playing basketball and visiting students at a local school. These tours always strike us as being similar to visits to the zoo. Nice to visit for an hour or two but wouldn't want to live there. Photo opps with black kids. Looks good in the newspaper and on television. Former Arkansas governor Mike Huckabee (R) is running for the presidency and is serious about global warming because he supports nuclear power. 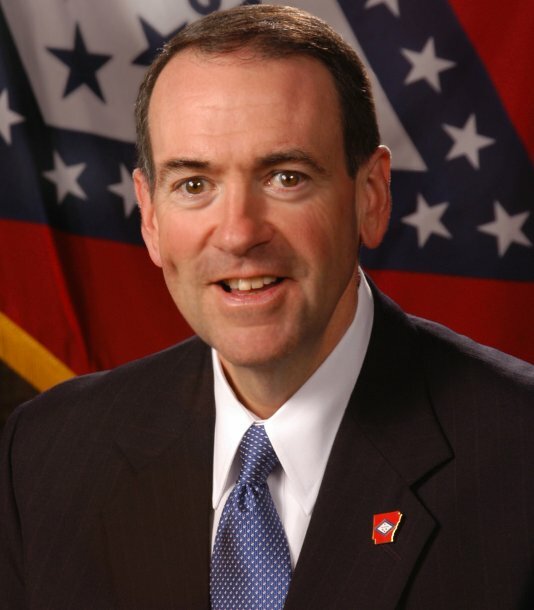 An enlightened conservative, Huckabee's announcement and press interviews have been very impressive. He has thought through all of the most controversial issues and can articulate a dynamic conservative point of view. We like Mike Huckabee. 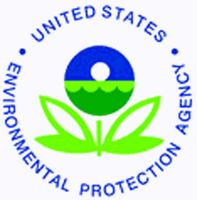 The United States Environmental Protection Agency logo is an interesting piece of artwork. Most people do not really pay close attention to it, but it merits scrutiny. It is a very good logo. The symbolism is subtle yet bold. 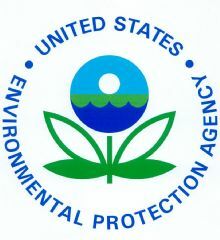 The colors are symbolic of the items EPA works to protect for the sake of human health and prosperity. Note the stem and leaf branches are green. The circle blossom is highly symbolic. Note the green at the bottom of the circle that represents the land, left. In a complementary logo, right, it is blue to represent the waters of wetlands, lakes, streams, creeks, rivers and oceans. There is green grassland above the water, thus showing the water below as groundwater. The circle blossom has a horizon through it middle that shows the Sun and Moon rising and setting. The sky is blue. A complementary concentric circle is created by the writing of the name of the agency around the flower. It represents the Earth. The entire logo hangs suspended without an artificial border. Of course, some logos do have ring and square borders. So does the elimination of the earthly border mean that one day EPA would like to protect outer space? The Moon and planets? Beyond? Hmmmmmm. The blue green motif makes for a soothing represenation of environmental protection. Blue and green are the colors of choice to represent the environment. The stem and leaf branches could also easily be an insect, a dragonfly or butterfly. Very good job EPA. 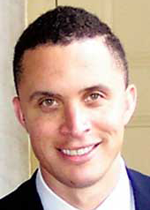 Former Tennessee congressman Harold Ford, Jr., left, is now Chairman of the Democratic Leadership Council (DLC), one of the leading Democratic think tanks in the country. In a recent email to his friends and supporters, he writes: "It is my hope to offer an agenda of national purpose that works toward reviving the American Dream, providing affordable health care to all those who seek it, energy independence over the next decade, balancing our budget and tackling entitlement reform and bringing peace and stability to Iraq and the Middle East." Former Maryland lieutenant governor Michael S. Steele, right, is the new Chairman of GOPAC, a national education and training center for Republican candidates and activists. Steele succeeds former Oklahoma congressman J.C. Watts, Jr. He will launch a public affairs firm, Legacy Strategies and he intends to write a book. The Ehrlich/Steele administration passed good legislation to protect the Chesapeake Bay and a good clean air bill. Integrated Capital, LLC is an African American real estate group and is the lead owner of the 162-room Residence Inn currently being built at National Harbor in Prince George's County, Maryland. The Residence Hotel is 100 percent minority-owned and is scheduled to open in March 2008. The construction and ownership package is part of Marriott's Diversity Ownership Initiative (DOI). DOI is designed to educate and provide assistance to minorities with significant business experience and an interest in hotel ownership. In 2005, Marriott made a pledge to have 500 minority- and woman-owned hotels by 2010. To date, Marriott has 30 minority- and woman-owned hotels open or under development in the Washington-Baltimore area. The Residence Inn at National Harbor, above left, will make the eigth minority-owned Marriott in the State of Maryland. The Residence Inn will make the fourth minority-owned Marriott hotel open or under development in Prince George’s County. 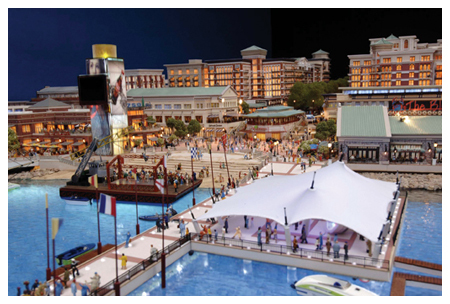 National Harbor is a $2 billion, 300-acre project that is anchored by the 2,000-luxury hotel room Gaylord National Hotel Resort and Convention Center, It will include residential, hotel, convention, retail, dining, entertainment and office space. The Achilles heel of nuclear power is nuclear waste because opponents say there isn't a solution for it. Nothing could be further from the truth. In fact, spent fuel from commercial nuclear power plants can be reprocessed and reused. Global warming and smog are prevented using nuclear power and these are the most important environmental issues facing us today. Unfortunately, the U.S. Department of Energy says it cannot open the national repository for nuclear waste, Yucca Mountain in Nevada, until 2017. This is unacceptable. There is no good reason to take this long to get a permit to open the repository. We understand that litigation, objections from NIMBY Nevadans and funding funny business are impediments. There is also the matter of this being the home state of the new Senate majority leader. However, the stakes for the planet are simply too high for America to move slowly on this project. We must assure an adequate and dependable allocation of funding from the Nuclear Waste Fund to accelerate permitting and operation of the site. We believe nuclear waste should be placed in an agency that has the sole function of managing nuclear waste. We are promoting the establishment of a Nuclear Waste Mangement Agency (NWMA) to centralize and accelerate the opening and operation of Yucca Mountain. We believe the facility could be operating no later than 2012. The NWMA would also manage reprocessing of spent nuclear fuel. 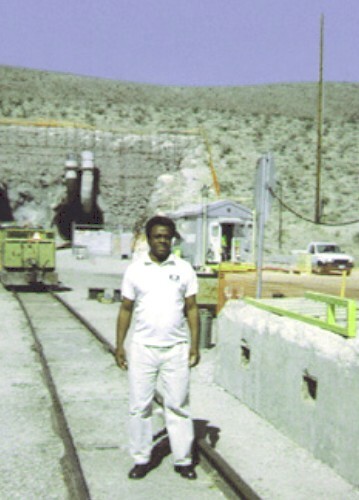 America should reprocess spent nuclear fuel at Yucca and other locations. The NWMA would give this important and challenging operation the singular attention needed to properly develop recycling and disposal of nuclear waste. Picture: AAEA President Norris McDonald at Yucca Mountain at five-mile tunnel exit. 1) Increasing The Supply Of Renewable And Alternative Fuels By Setting A Mandatory Fuels Standard To Require 35 Billion Gallons Of Renewable And Alternative Fuels In 2017 – Nearly Five Times The 2012 Target Now In Law. In 2017, this will displace 15 percent of projected annual gasoline use. 2) Reforming And Modernizing Corporate Average Fuel Economy (CAFE) Standards For Cars And Extending The Current Light Truck Rule. In 2017, this will reduce projected annual gasoline use by up to 8.5 billion gallons, a further 5 percent reduction that, in combination with increasing the supply of renewable and alternative fuels, will bring the total reduction in projected annual gasoline use to 20 percent. Additional highlights include: Help Confront Climate Change By Stopping The Projected Growth Of Carbon Dioxide Emissions From Cars, Light Trucks, And SUVs Within 10 Years, Stepping Up Domestic Oil Production, Doubling The Current Capacity Of The Strategic Petroleum Reserve (SPR) To 1.5 Billion Barrels By 2027, Facilitating The Growth Of Renewable And Alternative Fuel Sources By Increasing The Size And Expanding The Scope Of The Current Renewable Fuel Standard, Reducing Gasoline Consumption Through Increasing Vehicle Efficiency, Energy Policy Act Implementation, Advanced Energy Initiative, Stopping The Projected Growth Of Carbon Dioxide Emissions From Cars, Light Trucks, And SUVs Within 10 Years. Kansas senior Senator Sam Brownback is a candidate for the Republican nomination for the presidency. He is super conservative and hopes to keep the GOP true to its principles at the Executive Branch level of our national government. He was a broadcaster, teacher, attorney and member of the House of Representatives before becoming a senator. He is married to the former Mary Stauffer, heiress to a Topeka newspaper fortune. They are the parents of five children (three daughters and two sons). 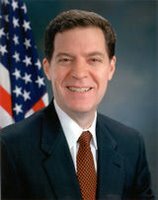 Senator Brownback supports nuclear power and is thus serious about reducing global warming. He voted for the Energy Policy Act of 2005 and opposed the Wyden Amendment against the Price Anderson nuclear insurance provisions. According to Blackelectorate.com, one of the nation's most well respected news outlets, Senator Brownback is very good on race relations issues. 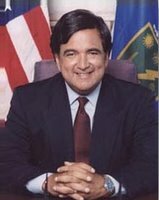 Two term governor of New Mexico, former Department of Energy Secretary, former congressman, former U.S. Ambassador to the United Nations Bill Richardson is running for the presidency. He is not enthusiastic about nuclear power, but accepts its usefulness in the energy mix. This makes him lukewarm on global warming. He wants to rely mostly on wind and solar that only operate 30% of the time and cannot dependably provide the electricity we need 24-7-365. A. The future in nuclear power is one that has to be on the table. The nuclear option has to be on the table -- not, however, at the expense of investments in renewable energy and technologies, which I believe hold more promise. But because nuclear power emits hardly any greenhouse emissions, and because its technology is improved, you have to look at it as an option. My worry is that there will be such a rebound in nuclear energy that we will not do the necessary investments in renewable technology and distributed generation and fuel cells. And nuclear power still has to resolve problems in waste, cost, safety, although its safety is improved. And nuclear power still has a lot of problems with the public, which the [nuclear industry] needs to explain, which it has not done so adequately. Politically they've sheltered themselves with one party. So they need to build alliances with environmental leaders, with local officials; they sort of sit in a bunker. But it should be on the table. The U.S. Climate Action Partnership (USCAP) is a new coalition of environmental groups and corporations calling for a mandatory cap on carbon dioxide emissions. The limits would equal 10-30 percent over the next 15 years and reductions of 60-80 percent of current levels by 2050. 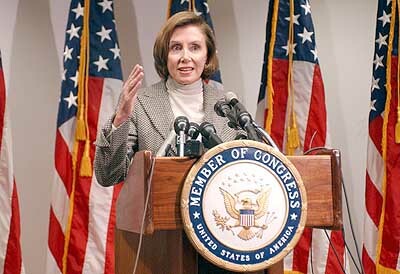 House Speaker Nancy Pelosi (D-CA) has created a special task force to examine global warming issues. The new Select Committee on Energy Independence and Global Warming does not have legislative authority. Did the Speaker just pull an end run on John Dingell (Energy) and possibly Charles Rangel (Taxes). Detroit Dingell would surely block the only way to reduce auto carbon dioxide emissions, mandatory efficiency, and Rangel has disagreed with the Speaker on tax policy. Enter Ed Markey, who will take no prisoners in promoting his and the Speakers energy and climate change agenda. Prospective presidential candidate and Illinois Democrat Senator Barack Obama along with Richard Lugar (R-IN) and Tom Harkin (D-IA) introduced the BioFuels Security Act, which would require the United States to use 60 billion gallons of ethanol and biodiesel a year by 2030. The triumvirate introduced the Fuel Security and Consumer Choice Act in 2006, which would require all U.S. marketed vehicles to be manufactured as Flexible Fuel Vehicles (FFVs) within ten years. FFVs can use both regular gasoline and E-85 renewable fuel (motor fuel with 85 percent ethanol content). The bill would require 10 percent of vehicles sold in the U.S. be FFVs within 18 months of passage. They also introduced the American Fuels Act of 2006 (S. 2446), which would increase the production of cellulosic biomass ethanol (CBE) to 250 million gallons by 2012, create an Alternative Diesel Standard that will require 2 billion gallons of alternatives diesels be mixed into the 40 billion gallon annual national diesel pool by 2015, provide a short-term, 35 cents per gallon tax credit for E85 fuel and provide automakers with a $100 tax credit for every E85-capable Flexible Fuel Vehicle (FFV) produced, and require that only clean buses be eligible for federal cost sharing, among other provisions. Introduced with 199 cosponsors on Jan 12 and scheduled for a vote on Jan 18, H.R.6, the CLEAN Energy Act of 2007, will shift roughly $14 billion in oil industry subsidies toward renewable energy and energy efficiency. 1) Strategic Energy Efficiency & Renewables Reserve, a fund for alternative fuels. Funding would come from amending legislation to require companies to pay royalties on deepwater production if oil or gas prices reached certain thresholds. The GAO estimates the omission of such royalties since 1998 and 1999 has cost the government nearly $2 billion. 2) Raising taxes ("YIKES") on domestic oil producers and spend the money to subsidize ethanol, solar energy, and wind power. 3) Renegotiation of oil company public lands royalty contracts or pay a $9 per barrel royalty fee from these leases or lose rights to bid on future leases on federal lands. 4) Rescinding $5-$6 in oil company tax breaks included in the Energy Policy Act of 2005. Officials from 45 African countries held the continent's first conference on nuclear power's potential contributions to sustainable development on Jan 9-10. They pledged to promote the safe and accountable use of nuclear energy. The conference was held in Algiers, Algeria and conferees discussed Africa's need for electricity from nuclear power stations. Mohammed El-Baradeï, director-general of the International Atomic Energy Agency pledged to promote technical cooperation within Africa. Africa has only two commercial nuclear reactors, both in Cape Town, South Africa at the same facility. Algeria, Egypt and Nigeria are interested in nuclear power for both electricity production and the desalination of seawater. 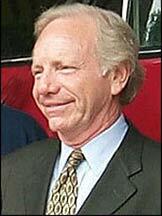 The McCain-Lieberman-Obama Climate Stewardship & Innovation Act (S. 1151) puts a cap on carbon pollution and requires that CO2 emissons be reduced by two-thirds (2 percent a year) from present levels by 2050 (to 2004 levels by 2012, 1990 levels by 2020, and below 1990 by 2050). The plan sets up a market to trade emissions allowances, allowing the free market to find the best solutions needed to achieve reductions. The legislation also supports alternative fuels and nuclear power. These senators are very serious about climate change. AAEA will work very hard to pass this legislation. Oh yes. He is running. The tour, book, film and the coming Oscar are not just to fight global warming. We all know that Vice President Gore is a calculating individual. Most times too calculating. We give him props on his global warming work since he left office. We must acknowledge that he and his boss' administration did nothing to promote climate change mitigation during their 8 years in office. So where does he stand? Here is what he said in Grist magazine, "I doubt nuclear power will play a much larger role than it does now. There are serious problems that have to be solved, and they are not limited to the long-term waste-storage issue and the vulnerability-to-terrorist-attack issue. For eight years in the White House, every weapons-proliferation problem we dealt with was connected to a civilian reactor program. And if we ever got to the point where we wanted to use nuclear reactors to back out a lot of coal -- which is the real issue: coal -- then we'd have to put them in so many places we'd run that proliferation risk right off the reasonability scale. And we'd run short of uranium, unless they went to a breeder cycle or something like it, which would increase the risk of weapons-grade material being available. Utility executives naturally want to place their bets for future generating capacity on smaller increments that are available more quickly, to give themselves flexibility. Nuclear reactors are the biggest increments, that cost the most money, and take the most time to build. In any case, if they can design a new generation [of reactors] that's manifestly safer, more flexible, etc., it may play some role, but I don't think it will play a big role." Of course, there were some signs of support for nuclear power during the Clinton administration: (From the e-Newsletter CounterPunch: "Another reason is that the nuclear lobby has enjoyed a long and profitable relationship with both Clinton and Gore. Al Gore, who wrote of the potential green virtues of nuclear power in his book Earth in the Balance, earned his stripes as a congressman protecting the interests of two of the nuclear industry's more problematic enterprises, the TVA and the Oak Ridge Labs." But before you get too excited, the Nuclear Information and Resource Service (NIRS) published a quote from a Gore letter, "I do not support any increased reliance on nuclear energy. Moreover I have disagreed with those who would classify nuclear energy as clean or renewable." So by his statements we put Gore in the antinuclear category. But true to his very calculating nature, he does hedge his bets. He and Clinton did nothing to hurt nuclear during their 8 years. They also did nothing to help (on nuclear & global warming). That is a good indication of how a President Gore would operate. Martin Luther King, Jr. took on the big challenges. From opposing the Vietnam War to oppression right here at home, he stood up as a leader and put his life on the line for his beliefs. History clearly shows that his beliefs were right. If he were alive today, he would be leading the fight to reduce global warming. His main weapon in that fight would be support for nuclear power. 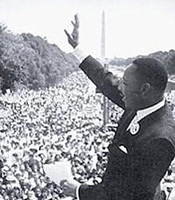 Rev Dr. Martin Luther King, Jr. would be an environmental justice leader today. As he said, "Injustice anywhere is injustice everywhere." Global warming cooks up a more volatile smog in urban Clean Air Act nonattainment areas. It is well documented that minority communities suffer most from air pollution because, not only are they exposed to general air pollution, they also have a disproportionate number of additional pollution sites located in their communities. We are certain that Dr. King would have addressed these serious threats to vulnerable communities. We just hope he would have time because Black-on-Black murder is the most serious issue in the African American community today. "Unprotected, above-ground nuclear power plants, loaded with radioactivity in their cores, would certainly be large liabilities if this country were ever under attack. They seem to make the country virtually indefensible. Quite aside from war or sabotage, an accident allowing just one percent of the inner radioactivity to escape from one plant would put as much harmful contamination directly into the environment as 10 bombs. And it would not be spread out all over the globe like bomb fallout; it would all be concentrated in just a few states. Suppose we had to abandon large sections of this land we love?" Whew. We think we know where he stands. Dennis Kucinich, left, is running for president again. He is a darling of the left and the traditional environmental community. He is not good on global warming because he rejects nuclear power as a part of the solution. 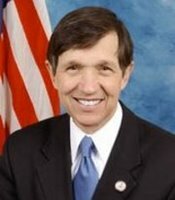 According to BigEye.com, "Congressman Kucinich acts upon his belief that protection of the global environment is fundamental to preserving the life of all species. He has been honored by Public Citizen, the Sierra Club, Friends of the Earth and the League of Conservation Voters as a champion of clean air, clean water and an unspoiled earth. He was an early critic of nuclear power as being risky economically, and environmentally, raising questions about nuclear waste byproducts." Thus, we must conclude that Kucinich is not serious about global warming. There is no way global warming can be mitigated without nuclear power as a big part of the electricity generation solution. Five-term Democratic Sen. Christopher J. Dodd, right, of Connecticut has announced his candidacy for president. He is very good on global warming because he is unambiguously pro nuclear power. Dodd, 62, is the fifth Democrat to officially declare his candidacy. We like Chris Dodd on climate change. He is serious. He clearly states on his website: "My record is clear. I have supported nuclear power and the obligation of the federal government to take responsibility for nuclear waste...No one knows the costs and benefits of nuclear energy more than the residents of my state. Connecticut has two operating nuclear facilities and two permanently shut down facilities that are undergoing decommissioning. Nuclear energy provides more than 45 percent of the electricity generated in Connecticut." 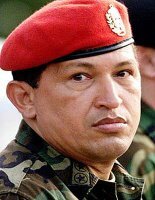 Although Venezuelan President Hugo Chavez won reelection and is supporting Joe Kennedy's election commercials-- oops-- low-priced fuel oil program for low-income people, he has announced plans to nationalize of electricity and telecommunications. This is right out of the Dictators 101 handbook. It is also bad business. There goes foreign investments in Venezuela. Probably the shareholders dividends too. AES, Verizon and other American oil companies will suffer under this state takeover. But America is Venezuela's biggest oil customer and Chavez hates us but takes our money. And we take his oil. Maybe Joe Kennedy can influence Chavez. After all, he did get him to pay for his campaign commercials. And where are Harry Belafonte, Danny Glover and Cornel West when you really need them to influence Venezuelan foreign policy? The 5,000 Shoshone Indians living in Nevada should support Yucca Mountain as the repository for nuclear waste. They should seek some sort of equity in the project. The main reason they should support Yucca Mountain is to do their part to support nuclear power as an emission free source of electricity, and thus a big solution to global warming. A secondary reason would be to participate in the business of electricity production. 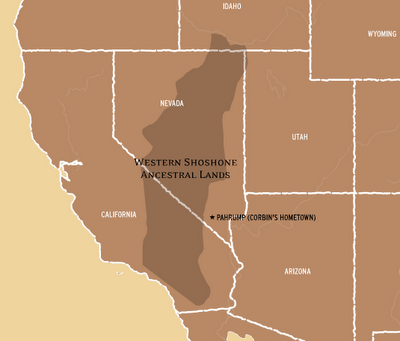 Unfortunately, the Shoshone have lost every battle-- military, legal, cultural--related to their western lands. Yucca could provide a victory that would provide economic benefits and mitigate negative climate change. Charles W. Wilson, right, has been nominated by Prince George's County Executive Jack Johnson to head the county Department of Environmental Resources (DER). Wilson was director of the Office of Information Tehcnology and Communications. DER oversees permits for all development projects, health & safety inspections, environmental management and storm water treatment. 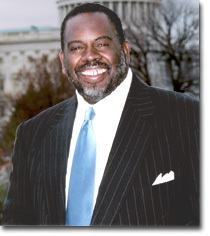 Wilson has worked for PG County government sine 1976. Governor Martin O'Malley has nominated Shari Wilson to be the Secretary of the Maryland Department of the Environment. 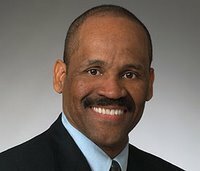 Since 2004, Wilson, 45, has been a chief solicitor for the Land Use Division of the Baltimore City Department of Law and represents the city in environmental, land use, and zoning cases, and has served as a Division Chief in the Baltimore City Department of Planning. She is an environmental law attorney and is currently an Adjunct Instructor at the Johns Hopkins University, Whiting School of Engineering. Previously, She served for seven years as a high-ranking official in for Governor Paris N. Glendening's MDE, working as director of policy management, coordinator of Smart Growth programs and administrator of projects to redevelop contaminated industrial sites. Wilson was Director of Policy Management at the MDE, Program Director for the Alliance for the Chesapeake Bay, and an Assistant Attorney General focusing on civil enforcement and cost recovery in environmental pollution cases. Wilson has received degrees from the University of Richmond, the University of Virginia, and the University of Baltimore School of Law. Rep. Albert Wynn (D-MD), left, was nominated by the Democrats on Nov 9 to chair the House Energy & Commerce Committee's Subcommittee on Environment and Hazardous Materials, a key House subcommittee with jurisdiction over EPA. Wynn, an 8th term congressman represents Prince George's County, the richest majority black county in the U.S. Congressman Wynn will be a great chairman. He is very smart on energy and environmental issues. Not only has he been an excellent representative for the fourth congressional district in Maryland, he has been a champion for the environment nationally and globally. Congratulations Congressman Wynn. According to The Washington Post, "The coal industry praises Obama's reintroduction, with Sen Jim Bunning (R-Ky.), of the Coal-to-Liquid Fuel Promotion Act of 2007 last week, which would provide incentives for research and plant construction. The industry says the technology, which converts coal into diesel engine fuel, would reduce America's dependence on foreign oil through a new, home-mined fuel that burns as cleanly as gasoline." Traditional environmentalists will scream at the 'Rock Star' senator now because he is not pure. They will not scream too loudly though because of Senator Obama's current popularity and his commitment to a clean environment in general. We are sure Senator Obama will support an equivalent carbon dioxide offset strategy and AAEA would be happy to advise him on his choices. Senator Obama is a member of the Congressional Black Caucus, which is, and has been for decades, the highest ranked caucus in Congress on environmental issues. The CBC does not get much credit for this in the mainstream media, even though most of the caucus is liberal and composed totally of Democrats. Message to the Democrats: Do not take away those private jets and lobster dinners. Just when the Congressional Black Caucus (CBC) has the most power in the history of its existence, the Dem leadership wants to take away a very important subsidy for mostly less than wealthy members. CBC members are not rich and the meager congressional salary is barely enough to get by on if they are supporting two homes and a kid or two in college. Same thing for less than wealthy white members. More disclosure is the better path. Our legislators deserve the best that America has to give. Moreover, the CBC has been the best voting caucus in Congress for decades on environmental issues, so clearly they cannot be unduly influenced. We want the CBC to travel in the best jets and eat the best food so that they will be in good shape to perform the people's business. Charles Rangel deserves to fly on the latest Gulf Stream. He already scoots around the Rayburn building in a cart. John Conyers too. Do we really want these two members who are in their 70s hustling through long waiting lines and wasting time taking off their shoes. We don't think so. Barack Obama has pledged to fly coach to stay in touch with the people, but he has plenty of money in the bank now that he has a best selling book. So keep those perks. We want a happy CBC. After all, they are almost 10 percent of the House of Representatives and they deserve a lobster/steak dinner on a private luxury jet after a hard days work. A recent Washington Post article listed the top 25 congressional corporate jet users and Barack Obama was the only CBC member on the list. Come on CBC. Are you not asking or are they not offering or both? Obama made the list but has pledged to ride coach to remain close to the people. Don't do it Barack. You're a very busy man. You're not like the rest of us. Victor B. McFarlane, Brian Davis and William H.C. Chang purchased the D.C. United soccer team from Anschutz Entertainment Group for $33 million. They now want to build a $150 million soccer stadium at the current location of the U.S. Department of Interior, National Capital Parks East headquarters. There is also a heliport at the location. The stadium would be across the Anacostia River from the new baseball stadium that is being constructed. The U.S. Park Service has transferred the 100-acre parcel to the District and Mayor Adrian Fenty is promoting more development in Ward 8. Victor B. MacFarlane, right, has been the Managing Principal of MacFarlane Partners, which provides real estate advisory services to institutional investors, since he founded the partnership in 1987. Mr. MacFarlane has 25 years of real estate experience and holds a master's degree in business administration from the University of Pittsburgh, a juris doctor degree from the University of California, Los Angeles, and a bachelor's degree in university studies from the University of New Mexico. Mr. William H.C. Chang is Chairman and CEO of the Westlake Group. Westlake is a diversified investment company, headquartered in San Mateo, California, with operations in China, Japan, and the US and over 4,000 employees. The firm has invested in various industries in China for over 25 years. Westlake's technology division helps U.S.-based companies penetrate the telecommunication and enterprise networking market in China. He his AB in Economics from Harvard College. 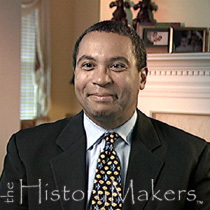 Deval Patrick was elected governor of Massachusetts on November 7th 2006. He is the first African American elected governor of Massachusetts and the second elected in U.S. history, after Douglas Wilder of Virginia. Patrick was born on Chicago's South Side in 1956, graduated from Harvard College in 1978, worked as an attorney and businessman, and married Diane Bermus. They have two daughters, Sarah and Katherine. The largest gathering of women in the world will take place October 2007. Leading up to the MWM Reunion mass gathering are several very important movement building events and Summits. The Million Woman March Action Summit will be held in April 2007 (DC) and The MWM African Women's Leadership Summit in October 2007 (Phila).There will be a panel discussion that will address issues relevant to the urban environment as well as the universal/world reality. The panel is intented to help educate, inform, prepare, encourage and train women of African descent to become more involved and visible in the environmental protection and awareness movement. The juxtaposition of the newspaper pictures for the recent deaths of President Gerald Ford and the Godfather of Soul James Brown made us realize that we cannot remember an instance of seeing an open casket for a white person at their funeral. The Washington Post even ran a big picture of environmental justice activist Damu Smith in his casket at his funeral. There were shots from above James Brown at the Apollo Theater. There were no pictures of Elvis Presley or John Lennon in their caskets. Are we off base here? We believe it is a racial/cultural/economic difference that has developed due to circumstances in the black and white communities. In the late 19th and early 20th centuries, the most important positions held by blacks were teachers, preachers and funeral home directors. Of course there were many different occupations for whites that carried status and economic security. So the art of making the dead person look as true to life as possible was and is evidently more important in the black community than in the white community. Moreover, the black funeral experience is probably a more emotional event than the white experience. Somebody at a black funeral is going to scream and holler. The little gossipers will also privately share negative comments if the person did not look like him or herself. There was and is competition among funeral homes for customers. They even adverstise to use their service because, "mistakes can be made." Graveyards are still pretty segregated. And we couldn't find any pictures of whites in open caskets. Regardless, we believe a green funeral is best. Mitt Romney, left, is a candidate for president and he supports nuclear power as a reasonable technology for producing electricity and mitigating the effects of global warming. In Boston.com Local News, former Massachusetts governor Romney is quoted as saying, "the nation is going to have to explore nuclear power sources again. I'm hopeful that as we invest in this energy sector, that here in Massachusetts we'll find ways to dispose of or to reuse the waste that comes from nuclear power plants." Romney supports expanding energy efficiency and alternative energy solutions including biodiesel, ethanol, nuclear, and coal gasification, and is in favor of drilling in the Arctic National Wildlife Refuge (ANWR) and the outer continental shelf to find more domestic sources of oil. 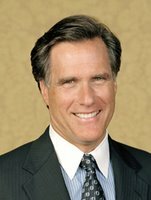 Romney supports regulation of greenhouse gas emissions, primarily through voluntary measures, and promoted the Regional Greenhouse Gas Initiative (RGGI). However, fearing significant price increases on the business sector, Romney pulled out of RGGI in Nov 2005. The last two weeks of December brings the annual pilgrimage to Mecca for Muslims to trace the steps of the prophet Muhammad and Abraham. The destination for hundreds of thousands of people in Mecca is the Kaaba, the black stone cube that is Islam's holiest site. Tens of thousands of Muslims circle the cube that sits in the middle of the Grand Mosque in Mecca, Saudi Arabia. The event itself is called the Hajj. Every able-bodied Muslim who can afford to do so is obligated to make the pilgrimage to Mecca at least once in his or her lifetime. The pilgrim, locally known as a Hajji, performs a series of ritual acts symbolic of the lives of Abraham (Ibrahim) and Hagar and of solidarity with Muslims worldwide. The Hajj is similar to a Christian traveling to Bethlehem or Jerusalem to recognize Jesus during the Christmas season. Hopefully, such a spiritual environment will spread peace throughout the Middle East. The District Department of the Environment (DDOE) serves as an agency within the Executive Branch of the DC government to consolidate the administration and oversight of environmental and energy programs, services, laws, and regulations. Under the authority of DC Law 16-51, the new DDOE was formed through a merger of the DC Government's Environmental Health Administration, the DC Energy Office, policy functions of the Tree Management Administration and policy functions of the Office of Recycling. The new DDOE is a one-stop-shop for programs and services that protect human health and the environment and address energy efficiency issues for all sectors of the city. DDOE operates programs and services that facilitate cleaner air and water and, green our neighborhoods and building space and, helps to manage hazardous and toxic waste disposal. DDOE conducts community and educational outreach to increase public awareness of environmental and energy related issues. 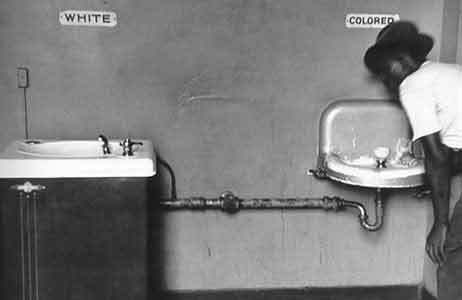 Although Blacks are operating effectively at the highest levels of American society, schools and neighborhoods are as segregated as ever. Why? Harvard professor of sociology Orlando Patterson says, "although it would be naive to discount persisting white racism...the major cause is that Blacks generally prefer to live in neighborhoods that are at least 40 percent black." Is that why the Blacks in the richest majority black county in the United States, Prince George's, seem to be so happy and satisfied? Maryland is about 20 percent African American and Prince George's is about 60 percent black. So Blacks get the beautiful homes and lawns without the racial distractions? So regardless of social class, the races basically prefer to live among their own. Ah. The American way. The freedsom to be personally discriminating in one's associations. And those choosing to live in more integrated neighborhoods appear to have the freedom to do so. Isn't America great? About a quarter century ago AAEA President Norris McDonald and Arnita Hannon worked together at what is now Friends of the Earth. They were the dynamic duo running the Energy Conservation Project and leading the fight in Congress to protect automobile fuel economy standards. 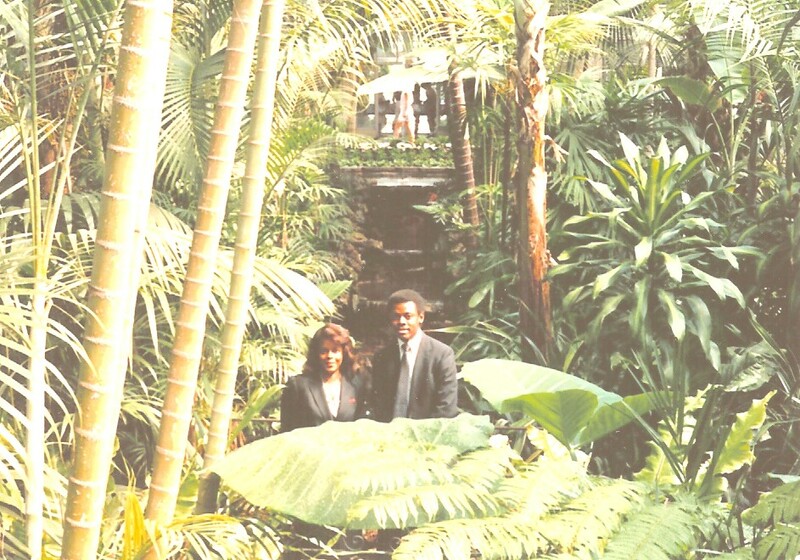 They are pictured above in 1983 at an organization newsletter promo shoot in the Botanic Gardens on Capitol Hill (or is that Eden?). Arnita Hannon later worked for the American Petroleum Institute and the State of Texas. Prior to her environmental adventures, she was a legislative aide to Congressman Parren Mitchell (D-Md). Arnita now works for the U.S. Environmental Protection Agency in intergovernmental affairs. The agency is very lucky to have such a talented and committed young woman representing them. We really like Senator Joe Biden, left. Joe Biden is probably the best foreign policy expert in the United States. As the new chair of the Senate Foreign Relations Committee, he will have significant input and a very visible platform for expressing his views. And as we all know, Senator Biden has no problem expressing his views. Senator Biden is also approachable and willing to chat on the elevator with the average citizen. Moreover, Joe Biden is serious about climate change and we believe he is willing to promote nuclear power as a primary solution to the problem. Joe Biden would be a very good president. 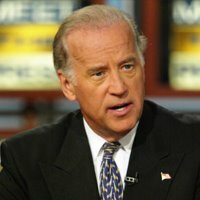 Senator Biden seems to be okay with nuclear power because he voted for the Energy Policy Act of 2005. Biden was a cosponsor of the McCain/Lieberman Climate Stewardship Act and he voted for the very nuclear-friendly Climate Stewardship and Innovation Act. But he voted against Yucca Mountain and he does not like the Price Anderson Act. He has consistently voted against this important subsidy on amendments to the various energy bills over the past few years.